About thirty years ago I took up contra-dancing. Contra-dancing is an American form that developed from English country dance (the partnered lines of dancers that you see in Jane Austen movies). It was great exercise, the live music was exhilarating, the community was welcoming, it was an all-around great way to spend an evening. After a while, though, life intervened, the community became a little gossipy, and the exercise became a bit too much for someone with asthmatic tendencies. I drifted away. Still, I miss dancing. So today, I want to celebrate dancing, even if it's someone else doing it! And I'll do it through poetry. It took me a long, long, time to actually complete a golden shovel. If you follow the Poetry Friday blogs, you've found that the golden shovel seems to have become "The Form" of 2017-2018. Everybody's been writing marvelous ones and I'm coming up with uninspired, pedestrian, poems. I tried too hard to write one using a line that was too long. I'm a short form writer, so why was I beating myself up trying to write something using a dozen or more words? Duh! I found this quote by Charles Baudelaire that was short and spoke to me. I am a big Facebook user and a viewer of innumerable videos of cats and dancing babies. So, is it any wonder that my golden shovel turned out like this? Before anything else comes dancing. oh, how she kicks those chubby legs! What follows are a few non-golden-shovel, dancing poems from my files. The first is from January 2011.
dance with a broken heart." An ekphrastic tanka from November 2012 inspired by "The Peasant Dance" (1568) by Pieter Bruegel the Elder. The last one was written for Laura Shovan's Sound Poem Project in 2015. A few whistles a bird. A few licks a puppy. Too many whistles a penalty. Too many licks an assault. A few jumps a dancer. A few words a poem. Too many jumps a diagnosis. Too many words a rejection. A few flowers a nosegay. A few tears a reunion. Too many flowers a funeral bier. Too many tears a broken heart. Jama's Alphabet Soup will be hosting the Poetry Friday Round-Up for this week. Enjoy the feast! Oh my goodness, Diane - what an array! I didn't know you had done contra-dancing (though my mind immediately said, of COURSE she does contra-dancing!!). I love how you made such a jaunty, kicky golden shovel. --That last stanza of the last poem - wow. Thanks, Robyn. Golden shovels aren't my cup of tea, but I'm glad I finally finished one. You make me want to rise up, and dance! I do love that you figured out that your own golden shovel needs to be brief, and love those "chubby legs". We have old home movies with people loving babies, mostly playing with their dancing legs. Your poem make me remember! I do love that final poem, each part also a memory. Thanks, Diane! I don't know where the old movies from my family ended up, how sad is that? Love your golden shovel -- that baby made me smile -- I could picture every movement you described so well. Interesting to hear about your experience with contra-dancing too -- never knew it was called that. Love the sobering truths in your last poem, the effective contrasts in each stanza. I once was going to start on a series of haiku of contrasts. I had planned to call it, "haiku for two points of view." Love the line, “before anything else comes dancing,” - brought me the feel and visual of all that womb dancing going on before birth! I’ve never been too coordinated to dance, but who doesn’t love a little bee bopping now and then? Still not sure about what a golden shovel is. Thanks for the lift on this rainy day, Diane! Ah, Vicki, I can SEE you dancing! Coordination be damned! Your comment made me do a happy dance, Michelle! Diane, I am a dance lover so I was thrilled to read your collection of poetry today. Of course the one that hits home with me is your first one because you brought the picture of my little one right into my mind. I enjoyed reading all your poems and I agree with Robyn the last stanza of the last poem is marvelous. Your little one is getting so big already! Hold on to those pictures in your mind. Now I'm ready to kick up my heels! These are such fun poems! And yes, that golden shovel form is challenging. I did one, but haven't gone back to it! Well, now that I've got one under my belt, I can move on. I didn't like not being about to meet the challenge. 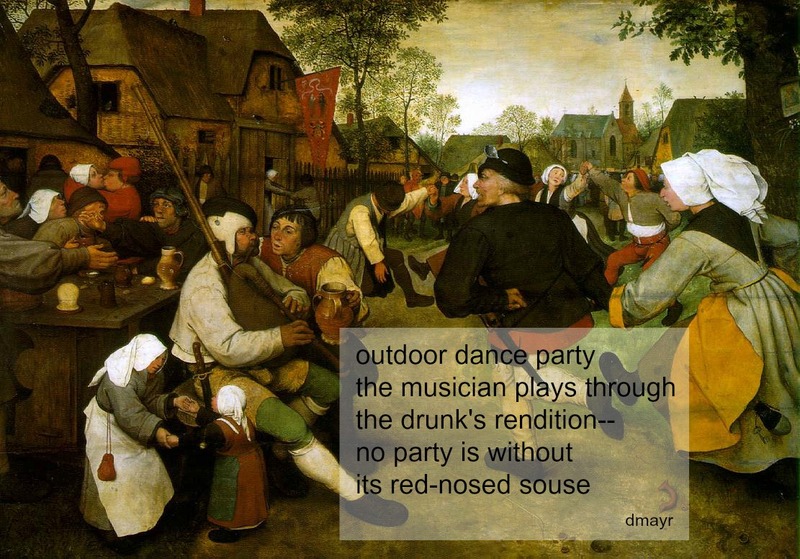 That golden shovel takes the prize, I laughed all the way through, had to read it again and am still smiling :) Great post–I like your ekphrastic tanka and the "red nosed souse," thanks! "Souse" is a good old-fashioned word, I don't know when I last heard it. For a post dedicated to dance and sound, I feel like I've been on an emotional rollercoaster - between babies dancing, licking puppies, and funerals! All very pointed in their approach to the subject, though - thanks for sharing! Such a great celebration of dancing! Your shovel is wonderful! and I love your final poem, the contrasts of "A few... Too many." The final stanza is so amazing. There's always more than one side to a story, isn't there? What a delightful celebration and post! Thank you for all the dance...I love to dance too. And, it has kind of left my life due to adulting. Your golden shovel is perfect. The wiggling tush of the baby gave me a laugh...because it's so darn true! Well done, Diane. Linda, at my library we've been talking for years about having an 80s summer dance party some July night. Maybe this year we'll do it! You should never let adulting get in your way! It's amazing to me how music can literally move even the very young. How much fun must it have been to contra dance with a group of friends! Your golden shovel made me smile - no one dances with quite the exuberance of the little ones. Loved this post and that wonderful, quirky golden shovel--the "bobbin' noggin" and those "chubby legs!" For some reason it made me think of the dancing baby in the TV show, Ally McBeal. Your other poems are wonderful as well. The last one is so clever! Thanks for all the dance! I, too, am a former dancer, but mine was square dancing. Your golden shovel turned out fabulously -- yes, part of the key is short quotes!! I love that last one.